Hello and welcome to the third update in our SurpassingPep series. If this is your first post, I urge you to go back and read either the last part or the introduction so that you know what’s going on! You can find these posts linked below. SurpassingPep Introduction – What is this series all about? Now that you know what we’re up to, let’s get straight into Part Three. In this part we see where our managers are after two more years, so seven years into their managerial careers. Here’s where they were at the end of Part Two. I ran a poll over on my Twitter (@VivaLaVidaFM) which allowed my followers to choose which two nations I would add to our simulation. The results of the poll are shown below. Which nation should be added to the simulation? 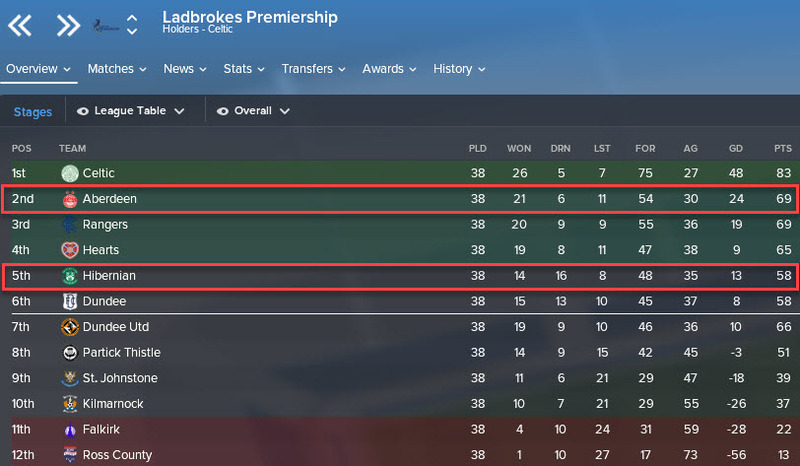 With France and Sweden (to be added in December 2022) now joining our simulation, how will our managers fare in the sixth season of this experiment? Let’s find out. Tom Robinson became the first manager in the series to reach the English Premier League. He was approached by Huddersfield after being sacked by Championship side Aston Villa and he helped Huddersfield survive the drop. Who will be the next manager to reach the EPL? 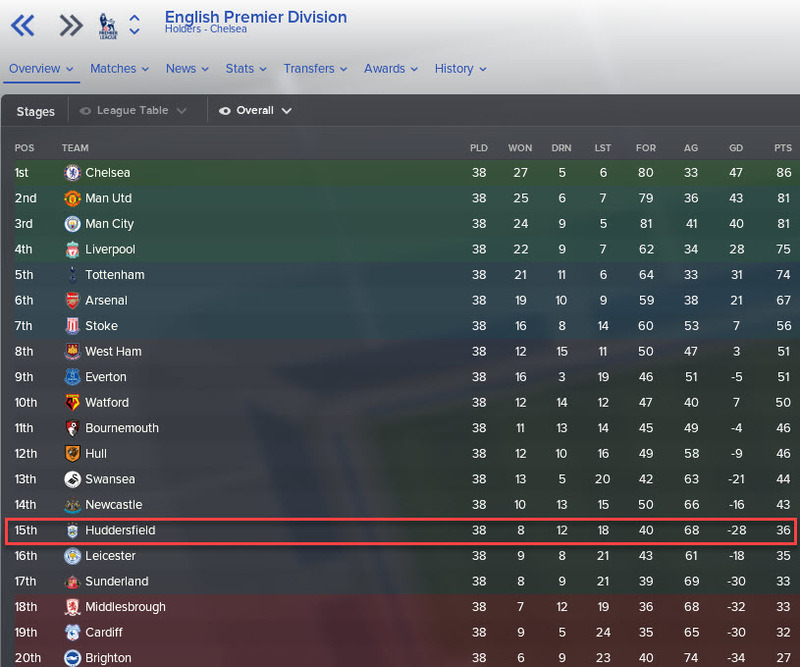 Aston Villa, now led by CasualFM, came closest to promotion but missed out on the playoffs. At the other end of the table, Keanu Jones was unable to save Plymouth from relegation after joining them midway through the season. Papa Playmaker took over from CasualFM at QPR whilst MyFMStory continued his rise – he left Plymouth for Preston who were actually below Plymouth at the time of the movement. A great move from him. 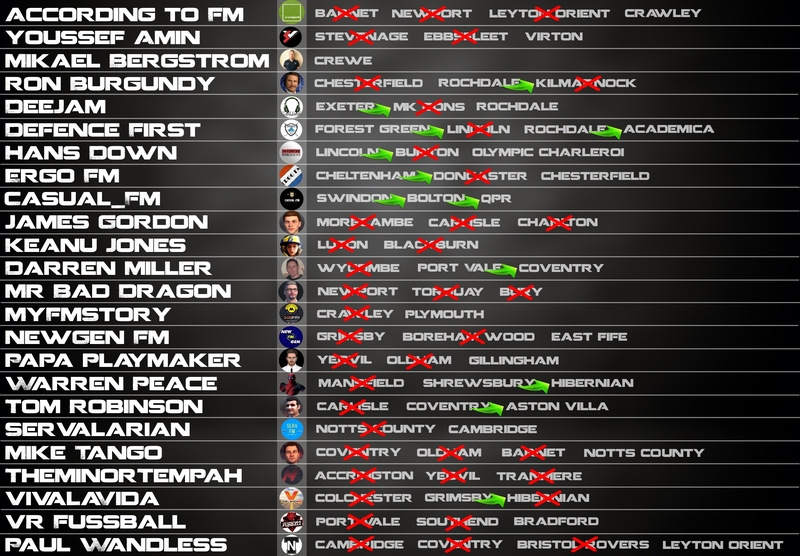 No success for any of our managers in League One this season. VR Fussball’s Bradford City came the closest but finished 1 place outside of the playoffs. There was far less to cheer about for Luton (Mikael Bergstrom), Coventry (Darren Miller) and Cheltenham (Youssef Amin) fans. Luton and Coventry will be relieved to have survived unlike unfortunate Cheltenham. 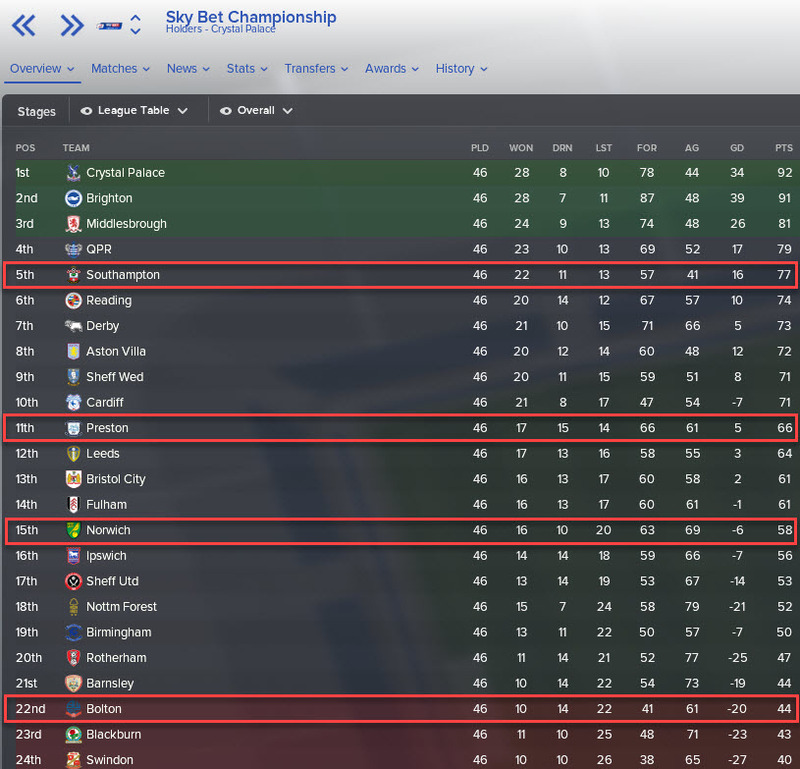 We have another League Two champion! ErgoFM, who has been linked heavily with moves to Dutch clubs, won the title with Chesterfield. 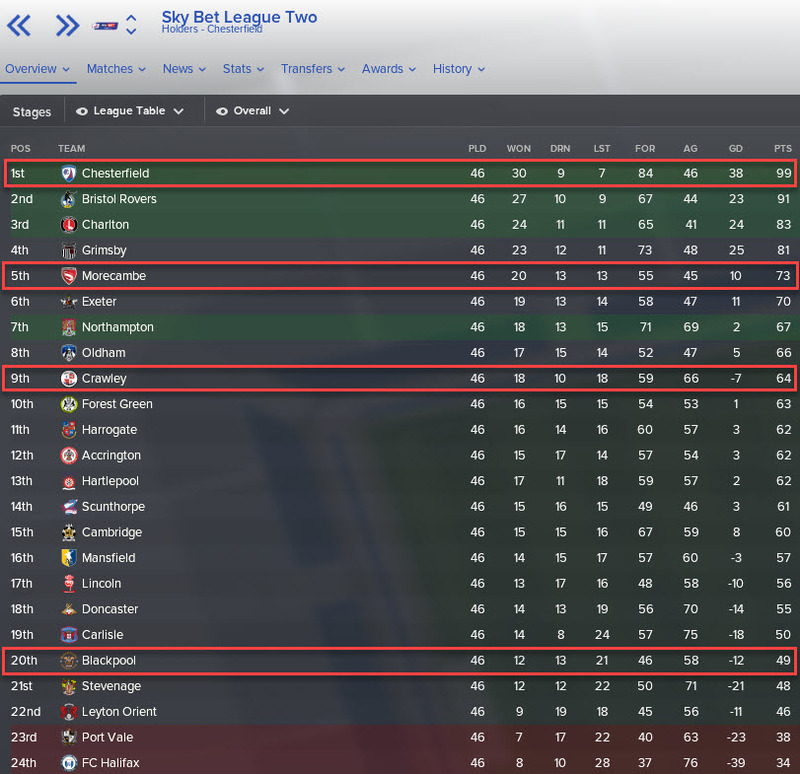 TheMinorTempah and According to FM had decent seasons with their clubs (Morecambe and Crawley) and will be looking to push on next season. James Gordon isn’t having the best of times with Blackpool. Maybe he should be looking to move on? Just the two managers competing in the Vanarama National this season. 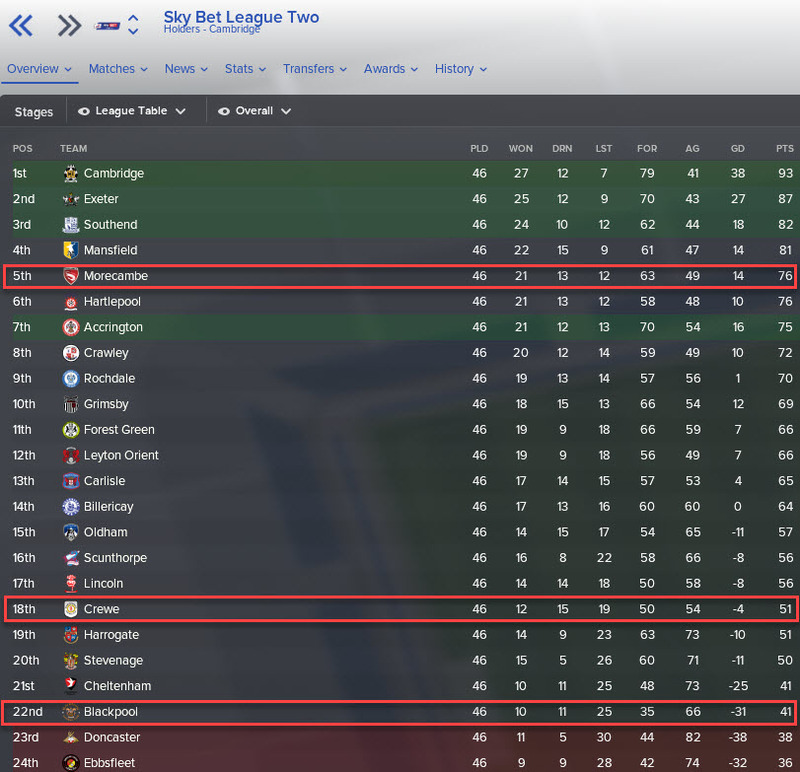 Mike Tango came so close to promotion with Notts County but came second and was unable to win the playoffs. Mr Bad Dragon joined Fylde and led them to 10th place finish. He’ll be hoping to guide Fylde to promotion in the coming years. VivaLaVida joined Aberdeen after being sacked from Hibernian last season. His new side came 4th in his first season and they also managed to win the Scottish Cup! A great first season for the Spaniard. Warren Peace led Hibernian to a 5th place finish, one behind Aberdeen. The battle between these two could be an interesting story over the coming years should they remain in their posts. 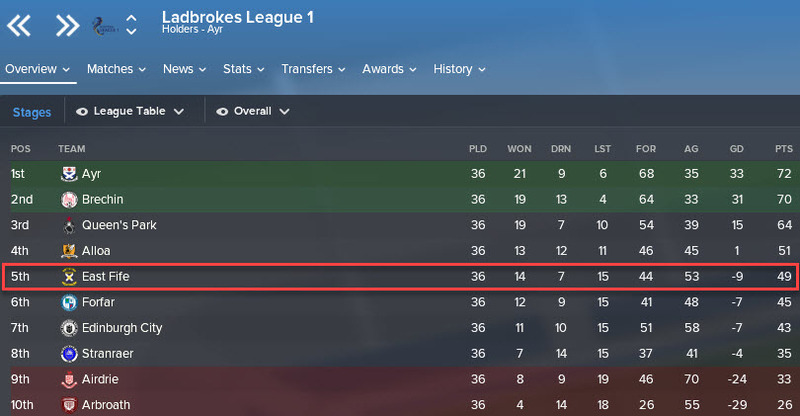 East Fife finished 5th under the leadership of NewgenFM. The Swiss manager has completed his third season with East Fife where he has suffered 1 relegation followed by immediate promotion. 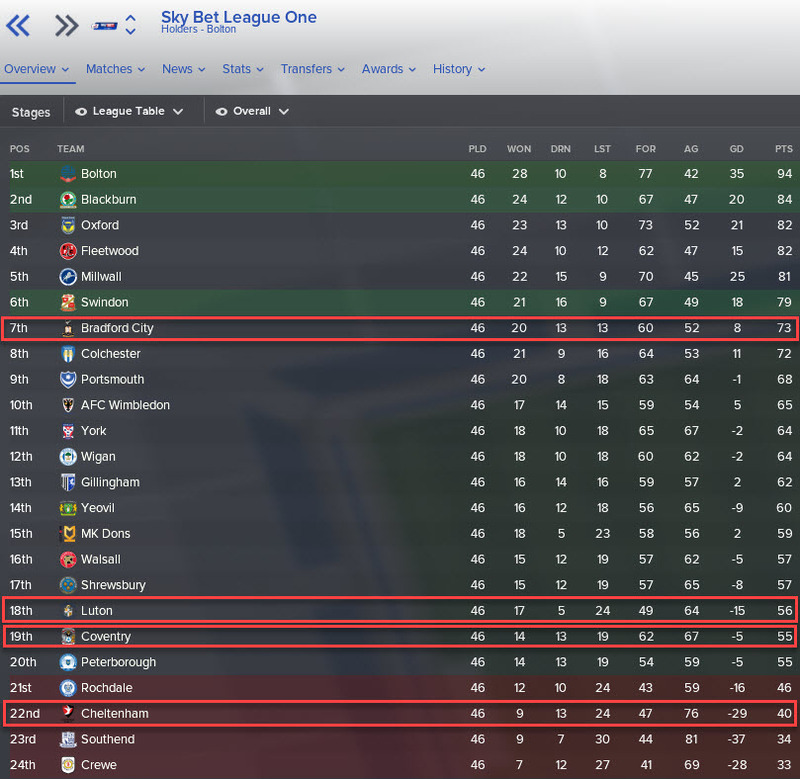 Can NewgenFM continue to rise the Scottish leagues? For the first time in this series, followers of my Twitter had the chance to choose the club in which a manager would be moved to. Ron Burgundy had been without a job for a year and therefore would be moved to another club using the editor. As Burgundy was sacked by a tier one club (Kilmarnock) he would be moved to another tier one side. The clubs available were: Rennes, Chaves, Charleroi and Zulte Waregem. 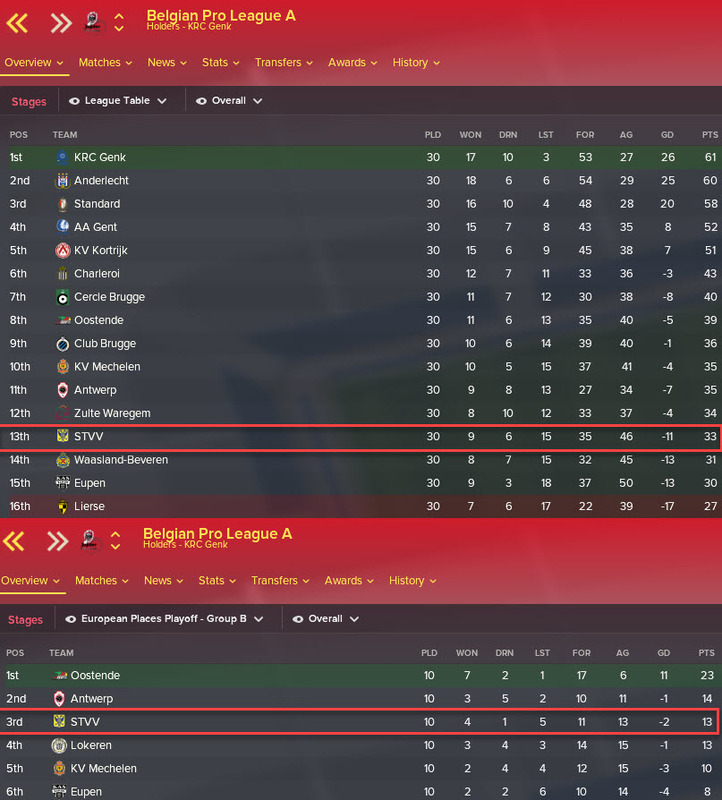 The result of the poll saw Burgundy move to Rennes and he managed to survive the Ligue 1 season as they finished just above the relegation places. 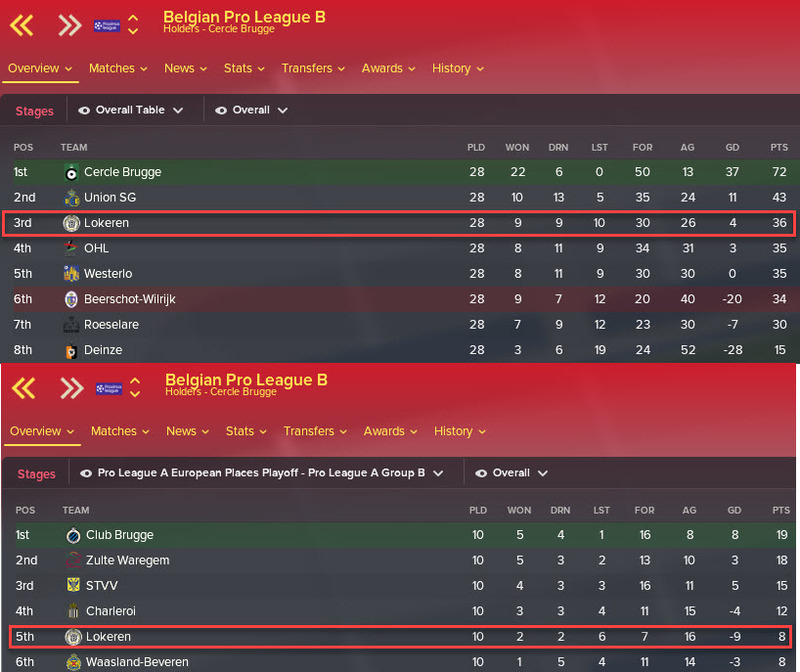 I’ve no idea how the Belgian leagues work. There seems to be a European playoff system in place even for teams in the second tier. Hans Down, with Lokoren, has had a decent season with his second Belgian club. 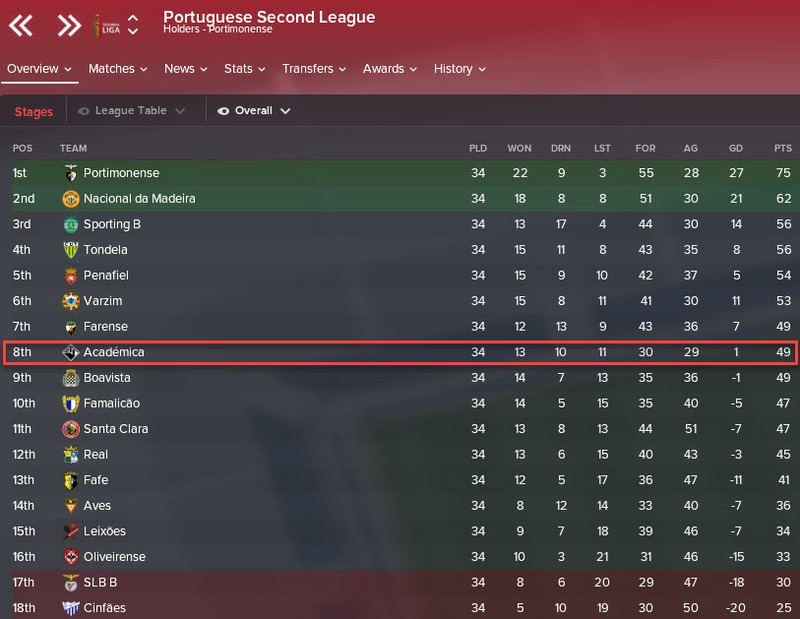 They finished 3rd in Pro League B before coming 5th in the European places playoffs. 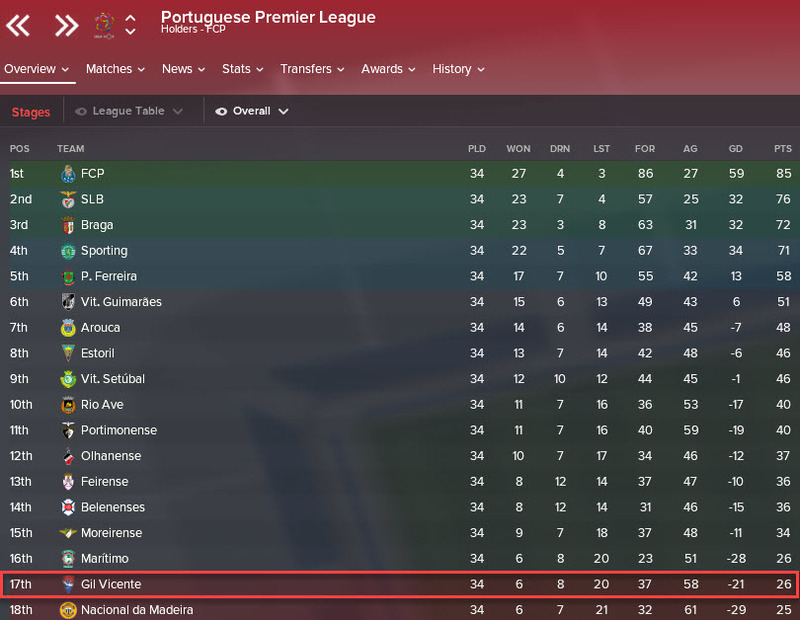 Our only manager in the Portuguese leagues is Defence First. He has led Academica to an 8th place finish in the second tier of Portugal. Portugal could be a great system for Defence First to climb considering he is native to the country. Will we see our Portuguese manager take charge of Porto or Benfica one day? 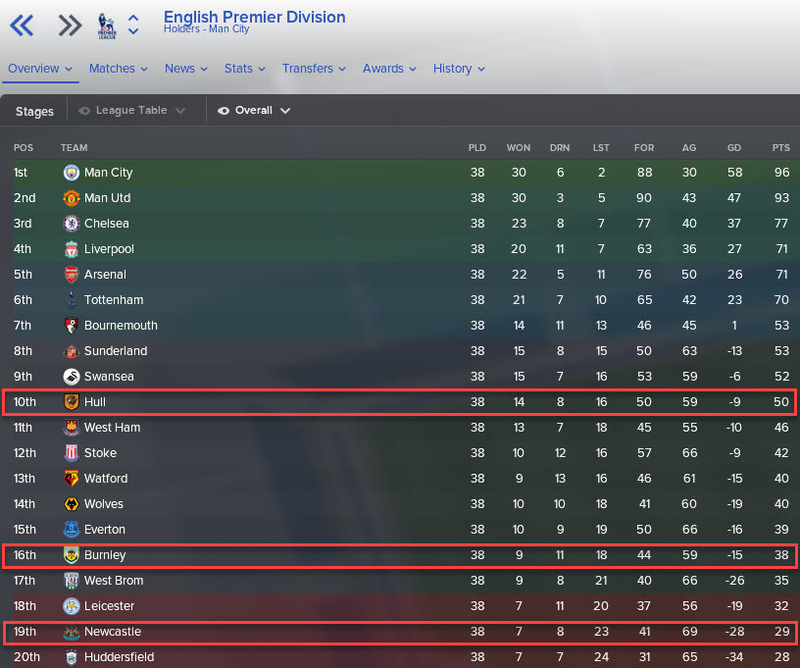 It has been a good season for our managers as we finally breached the English Premier League. What does season seven have in store for us? Three managers completed their seventh year with a Premier League club. MyFMStory left Preston for Hull, leading them to a tenth place finish, CasualFM joined Burnley after being sacked by Aston Villa and Papa Playmaker took the reins of Newcastle. 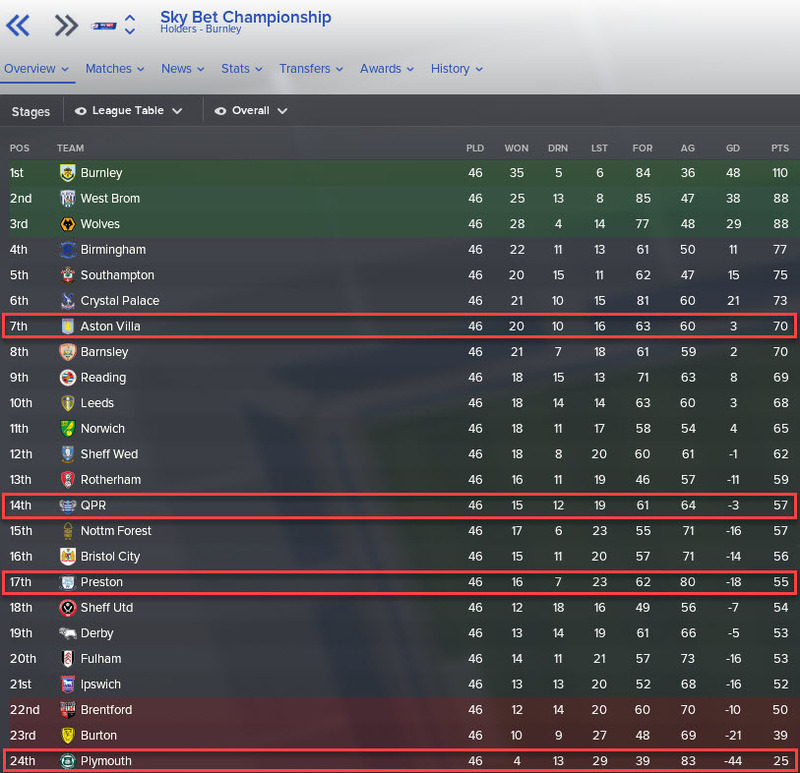 Unfortunately for Papa P, he was unable to avoid relegation with Newcastle and will drop back down to the Championship. Tom Robinson was sacked from Huddersfield after a poor start to the PL season but was quickly snapped up by Southampton. He led them to a playoff finish but lost in the playoff final! So close to a return to the PL! ErgoFM took charge of Preston after MyFMStory left for Hull, VR Fussball was appointed Norwich manager and Paul Wandless joined Bolton but was relegated on goal difference, a cruel way to go down! Just the two managers in League One. Darren Miller is approaching three years at Coventry and he’ll be hoping to improve his side to progress further up the table next season. 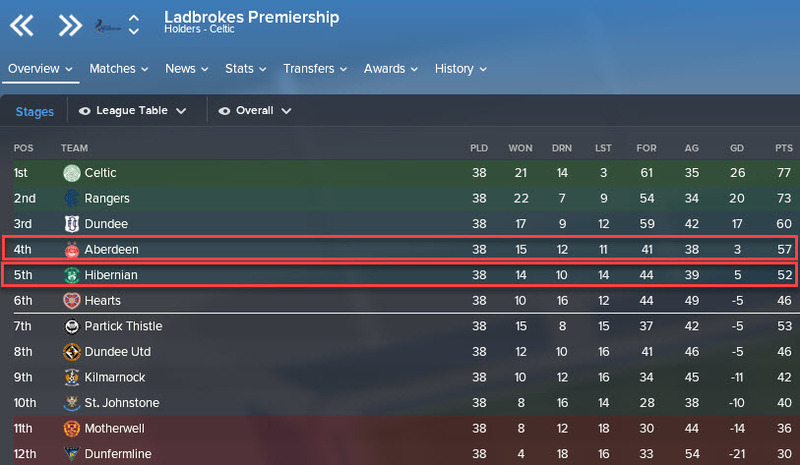 According to FM left Crawley for Chesterfield and will be happy with his decision, his new side finished 5th in League One. No promotions from the fourth tier of English football for our managers. Morecambe came the closest under the guidance of TheMinorTempah. Both Crewe (Servalarian) and Blackpool (James Gordon) will be disappointed with their finishes in the league. 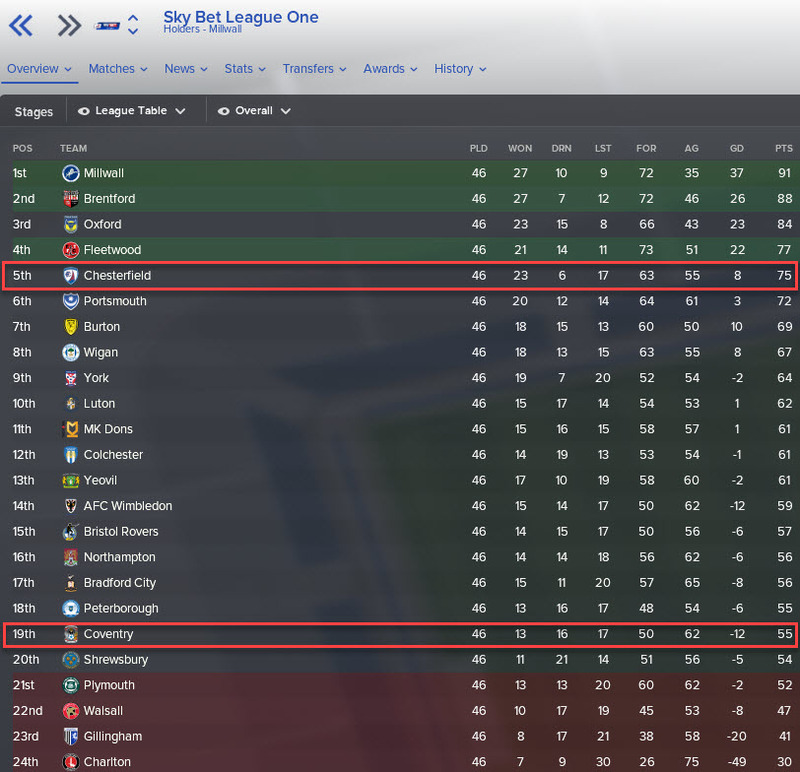 Blackpool again scraped survival, this time just one place above the drop. In the Vanarama National, two of our managers faced off in the playoff final to try and reach the Football League. NewgenFM, having recently joined Bury from East Fife, fought Mr Bad Dragon of Fylde. Fylde thrashed Bury 3-0 to win the playoffs and earn promotion to League Two. 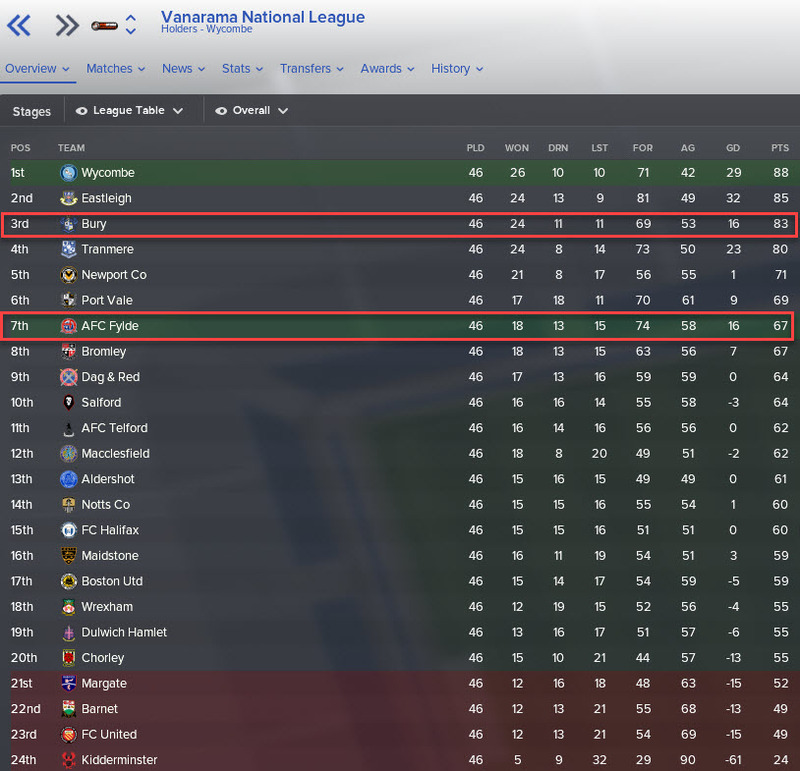 A bitter pill for NewgenFM to swallow as they finished 3rd ahead of Fylde in 7th. Now to the SPL where yet again VivaLaVida has won the Scottish Cup with Aberdeen! After Celtic won the Scottish Cup six years in a row, Aberdeen now have started a run themselves with their second consecutive victory. Warren Peace continued his consistent form with Hibernian as they finished 5th again. Ron Burgundy was sacked by Rennes in Ligue 1 but was quickly approached by Auxerre to become their manager. 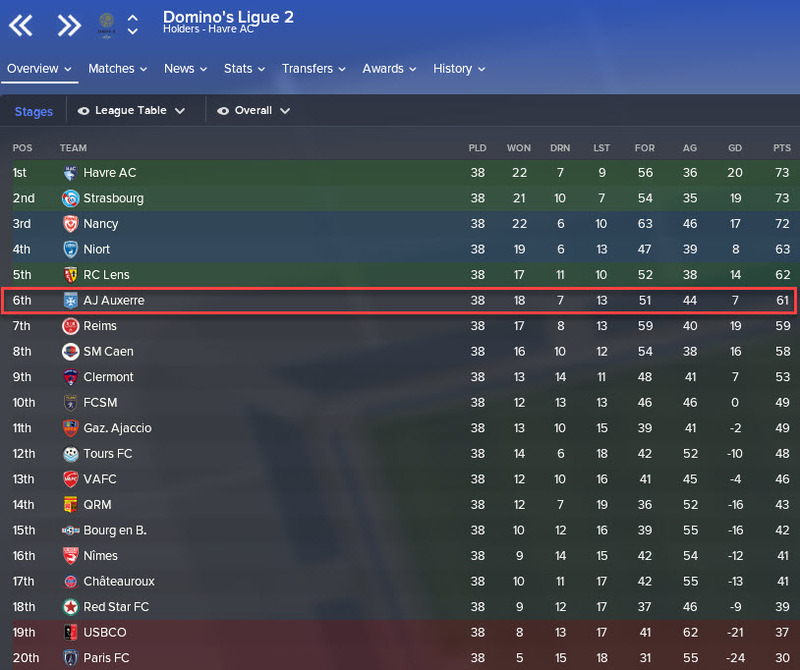 The Ligue 2 club finished in 6th place under Burgundy and will certainly be hoping for a promotion push next season. 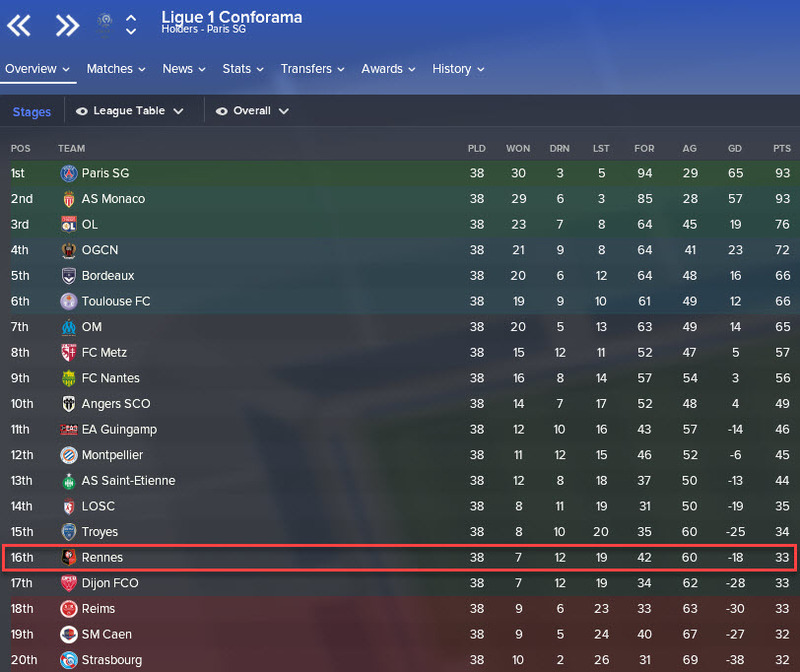 Can our American manager reach Ligue 1 once more? Hans Down is our manager in the Belgian leagues and he has made the move into the top tier! After guiding Lokoren to a 3rd place finish last season, top division side Sint-Truidense took a punt by hiring the German and he has not let them down, securing safety for his new club. 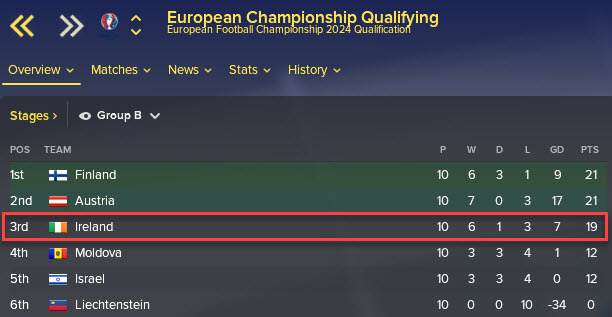 In the European places playoff they came 3rd. Former Academica boss Defence First moved on to manage top tier Portuguese side Gil Vicente in season seven. Regrettably he failed to secure survival with them and was relegated back to the second tier. We have our first manager in Sweden! And yes it is of course Mikael Bergstrom. The Swedish manager has joined Helsingborg and will take charge midway through the Swedish season. As the Swedish season runs differently to the rest of the leagues we have loaded (Sweden runs from Feb – Nov, I’ll update how the season went for Bergstrom in the next post. And finally we find out how our first international manager has fared. DeeJam took charge of his home nation Ireland and led his side through the European Championship Qualifiers. Unfortunately Ireland were unable to reach the Euros in 2024 but they fought valiantly in the group. Two years have progressed since our previous update. In those two years we have seen some success, most notably in Scotland, and several failures. Shown below is the current points table where VivaLaVida leads the way. Two Scottish Cup wins really helped push him up the table. But it only takes a league win or two to really close the gap.